SUNY Oswego senior biology major Manna Job recently earned Top Presenter recognition in the Ecology and Evolutionary Biology category for college participants at the Sigma Xi International Conference for “Effects of Atrazine on Freshwater Mussels (Elliptio complanata),” research conducted with biological sciences faculty member Poongodi Geetha-Loganathan. The sign displays another honor at the conference -- the SUNY Oswego chapter earned a Sigma Xi Chapter Program of Excellence Award. OSWEGO — SUNY Oswego senior biology major Manna Job recently earned a top prize at the Sigma Xi International Conference for research on how a widely used chemical impacts the environment. SUNY Oswego senior biology major Manna Job recently earned Top Presenter recognition in the Ecology and Evolutionary Biology category for college participants at the Sigma Xi International Conference for “Effects of Atrazine on Freshwater Mussels (Elliptio complanata),” research conducted with biological sciences faculty member Poongodi Geetha-Loganathan. 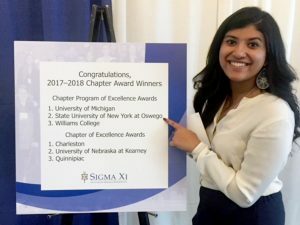 The sign displays another honor at the conference — the SUNY Oswego chapter earned a Sigma Xi Chapter Program of Excellence Award. Job was one of four Oswego students — along with Asya Kadic, Bianca Fernandez and Jack Marcucci — to present research findings, all for work with biological sciences faculty. Kadic also collaborates with Geetha-Loganathan, while Fernandez and Marcucci perform research with Yulia Artemenko. “I think it’s a project of significance because we are spending time studying these chemicals in animals,” Job said. Mussels are a common biomarker — they are filter feeders that absorb and diffuse chemicals into their cells — which makes them ideal to study. 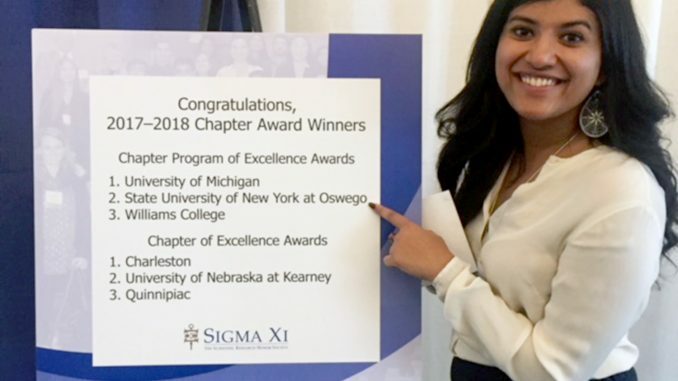 In addition, the SUNY Oswego chapter earned a Sigma Xi Chapter Program of Excellence Award for the “Sigma Xi Student Award at the Quest Symposium” program. 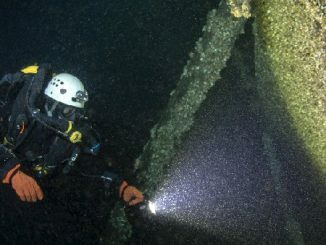 For more information on biological sciences academic programs and research at SUNY Oswego, visit https://oswego.edu/biological-sciences.